Reception Class is taught by Miss Pearson and supported in learning by Miss Jeanette. The class is made up of children aged four and five. The role of the teacher is to settle the children into the Early Years environment and support their academic, emotional and social development throughout the year. This is done through carefully planned, adult input sessions for English, Maths and Phonics, one to one reading sessions, and play based learning opportunities to support their academic learning. We also take the responsibility of nurturing the children very seriously and support them by getting to know the children as individuals and encouraging them to express their own thoughts and opinions with each other as well as teaching them to respect the ideas of others. 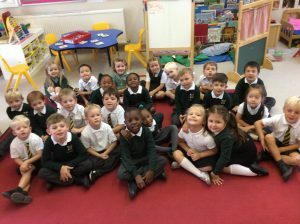 We encourage the children to develop new friendships with all the children in their class and strive to build each child’s confidence and independence. The Teaching Assistants work with all the children both in and out of class to provide additional support for all abilities in English, Maths, Phonics and reading.